Little Pancake, our redfoot tortoise, just passed suddenly but peacefully over the Rainbow Bridge . 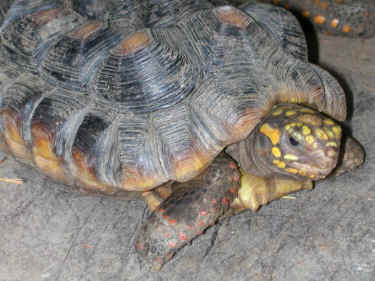 She arrived at American Tortoise Rescue in 2003 from owners who could no longer care for her. Unfortuately, like so many turtles and tortoises, she was housed in a tank with no access to sun and too much food. She came with metabolic bone disease but also with a sparkling personality that made you smile whenever you saw her. Pancake's under shell was severely deformed and her upper shell was badly pyramided. Together, this made what was happening to her internal organs easily imaginable. As her organs tried to grow normally, they were squashed between two unyielding shells. So the organs couldn't grow to their normal size. For the past nine years, however, we watched her thrive with her two redfoot pals Lola (a husky misnamed male), and Mommy, a well developed healthy female. Pancake crawled rather oddly but she was always bright eyed and bushy tailed and up for a great breakfast and a day in the sun. She and her companions live outside all year in their own yard with a heated house. About a year ago, she started acting a little slower so I took her to the vet who pronounced her healthy but sadly deformed. "You never know what's going to happen with these guys," he said. But I did. Our sweet loving Quasi, a severely deformed sulcata tortoise that had lived in a basement for three years in Chicago before joining us, also suffered from metabolic bone disease and a squashed in shell like Pancake's. She died a few years ago, and way too young as well. Pancake - we will always miss your bright spirit. Your time with us was way too short. Don't forget us. We'll never forget you! RIP sweet one.